This past weekend has been a blur! Price and I went out on Friday night for Brazilian BBQ with a meetup group. On Saturday morning Emily and I went to see “Cloudy with a chance of Meatballs” … in 3D…. on IMAX. Then I spent the afternoon ripping apart the kitchen. I purged some stuff and brought in a shelving unit to put my cookbooks on. So a lot of things shifted around but I think it works a lot better. Then we slept in on sunday, I went to my site for homework, birthday lunch with Pricer, and then lots of baking and cooking. So the next couple of posts will be about food and recipes, then I’ll get back to scrapbooking and random things. My boss told me that during a recent trip she had green tomato bread. Being that my tomato plants halted their ripening I figured this would be good way to use them up, besides fried green tomatoes. I found a recipe that looked pretty good so I figured it would be worth a try. I’m so glad she told me about Green Tomato Bread and that I actually tried it. 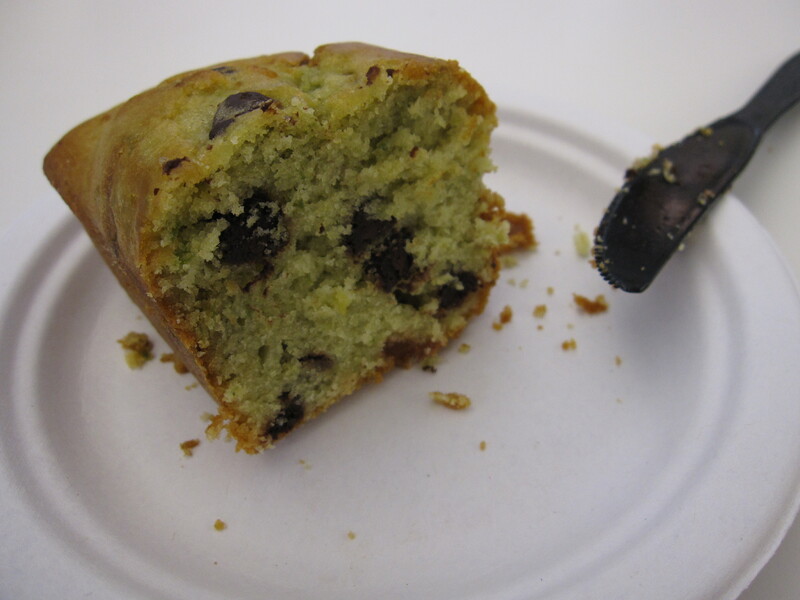 I made 2 kinds- lime and chocolate chip- and both came out really well. I never would have thought of using green tomatoes in a bread but it keeps the bread moist and gives it a sweet tomato flavor throughout. I think the lime zest (approx 1 T) brings a sweet tang to the bread. I used 2 cups of chocolate chips, which I think is a bit much but it still tastes pretty good. Preheat oven to 350. Grease and flour 2 9×5 loaf pans. Puree the green tomatoes, add water if needed. Sift the dry ingredients together, set aside. Beat the eggs, oil, and sugar until well incorporated. Add in the green tomato puree and vanilla. Add in the dry ingredients, beat until well incorporated. Gently fold in the nuts and/or raisins, if desired. Divide batter evenly and pour into pans. Bake at 350° for 45-60 minutes. Freezing the puree ahead of time will save you from having the green tomatoes ripen on your counter top while you wait for the spare time to make this treat. 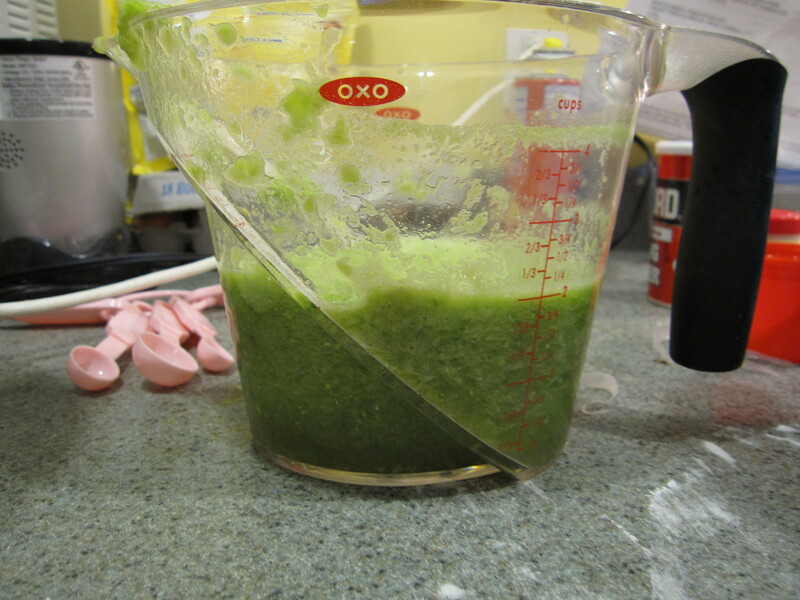 If you freeze the puree in 2 cup quantities it will be pre-measured and ready to go for a batch of bread. Sorry i meant to leave the comment here…. but thank you so much for the tomato bread! it was so delicious!!!!!! !